Hey, kids and budding space emperors out here! One of the best 4X space games out there – Endless Space – just got a major update, which, among various fixes, nerfs and buffs includes a whole new race and other player voted goodies. 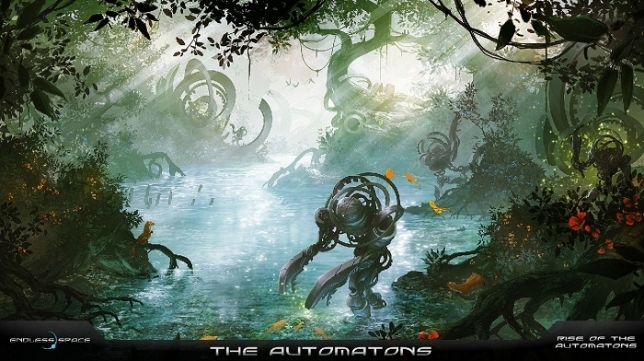 The Automatons are a race of hippie clockwork robots. Created by a race suffering from destruction of their homeworld’s ecological system, they became sentient after an Endless ship crashed on their planet and released the Dust. Now they want more of it and go in search of it. Their main trick is storing industry overproduction for various bonuses. How did they manage to win the vote against a race of nigh-immortal cyborgs from a high-G planet is beyond me. However, the Automatons use the Craver ships. Which reminds me, affinities and visual styles can now be selected independently of each other – useful if you want to flaunt the exclusive Sheredyn skins with any race you make. There are some updates to trading and alliances too, but the most significant thing for me is the confirmation button when adding abilities to heroes. These changes are, of course, followed by the usual gamut of fixes, changes and improvements. Check out my review of Endless Space and have fun - kill some Sophonts for me! I'm pretty sure this update also got rid of my save game.